This entrancing contemporary fairy tale is brought gloriously to life by Hans Christian Andersen Award nominee Jane Ray. 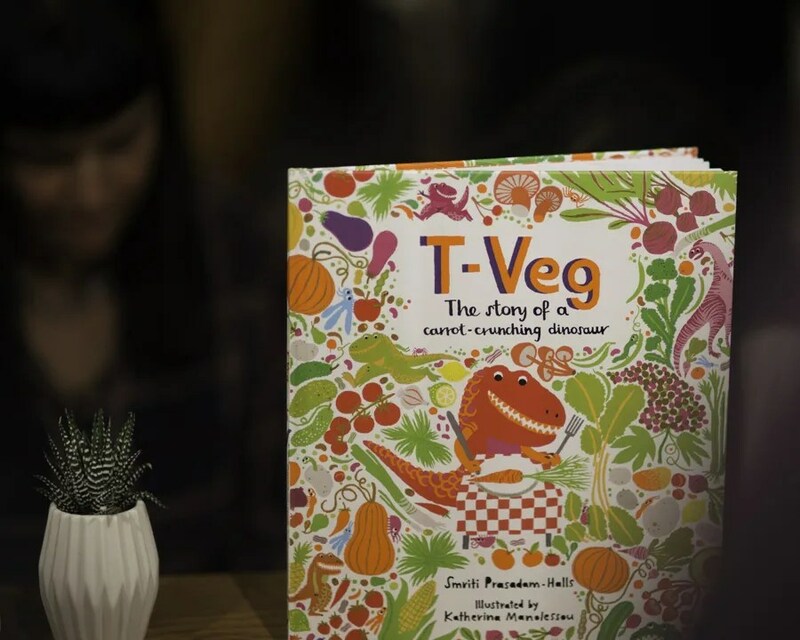 Having attended the launch for Katherina Manolessou’s first picture book, Zoom Zoom Zoom, it was a pleasure to be invited to the launch of T-Veg, written by Smriti Prasadam-Halls, illustrated by Katherina and published by Frances Lincoln. 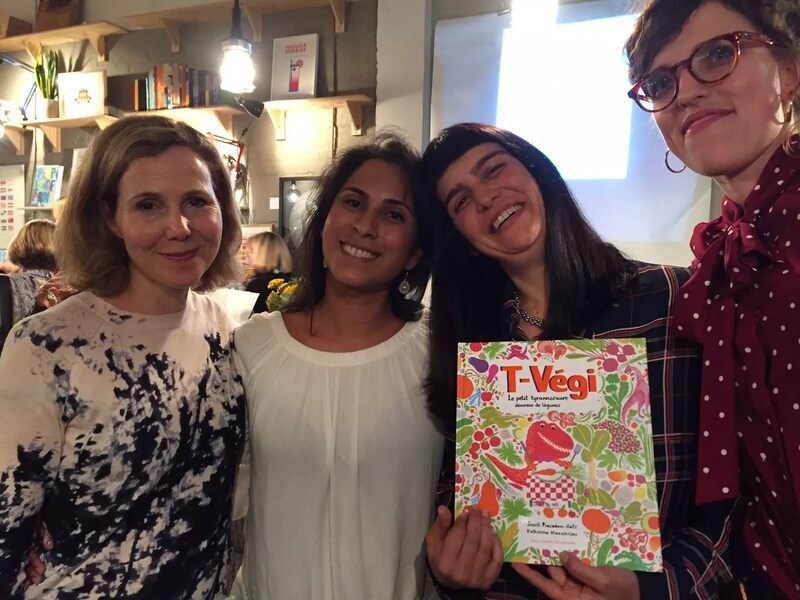 The venue was the same as for that earlier launch party, Material Bookshop & Gallery. 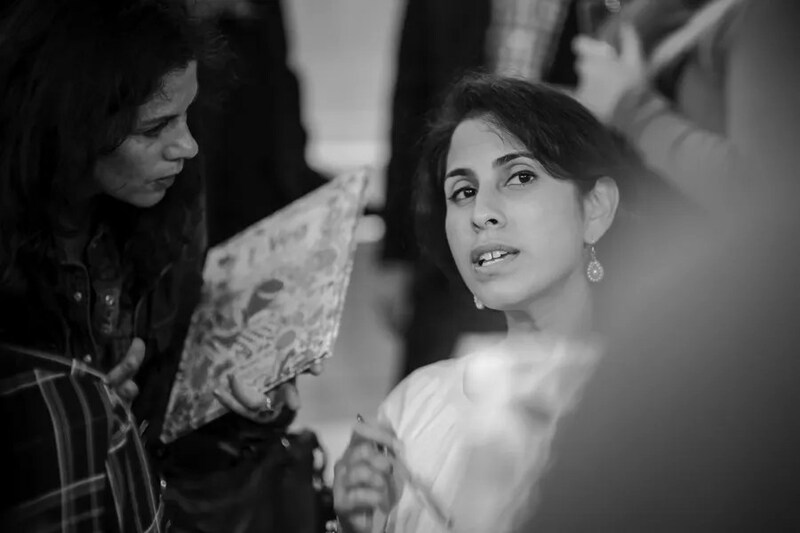 Katherina’s artwork from the book is being exhibited by the gallery and is on show until 20th September. 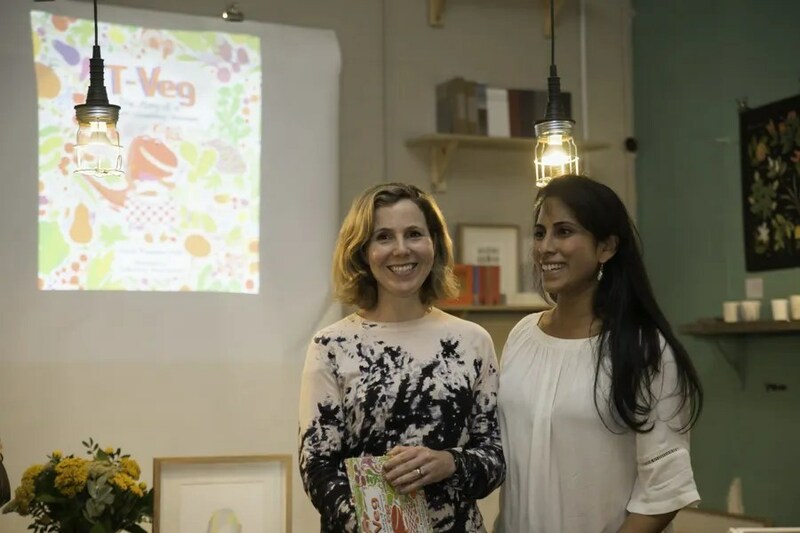 An unexpected pleasure at this launch was an appearance by one of my favourite comedians, Sally Phillips (of Smack The Pony fame), who performed a full reading from the book, after separate talks from Rachel Williams, the publisher, and then the author and illustrator. 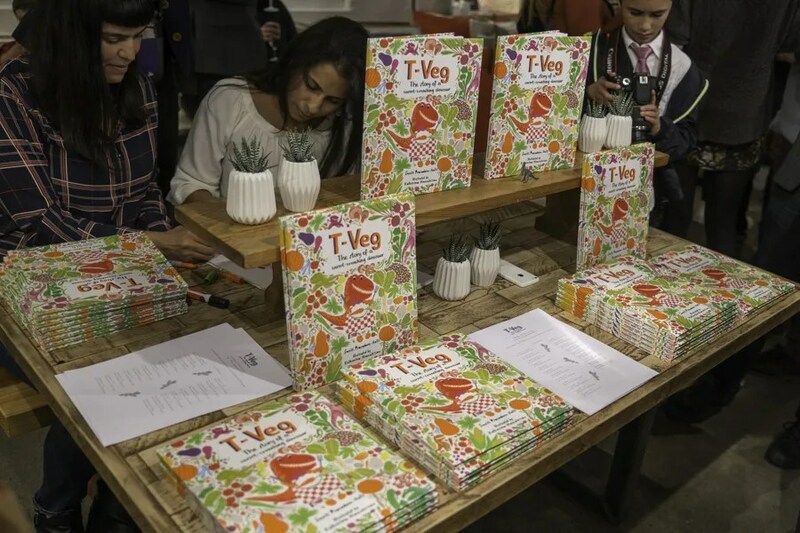 The launch was really well attended and after the talks a long queue formed for signing the book, which was being sold at a specially reduced price of £10 for the event. Hardly was I through the door to David Fickling’s office than he was up from his desk eager to share with me some special preview boxes for a forthcoming illustrated project that he is particularly excited about. Fickling is the kind of editor who exudes excitement for all his enterprises of course, but he did appear to be particularly animated on behalf of this one, the details of which I am sworn to secrecy about, except to say that I was shown and heard enough about the concept to say that I am just as excited to see the project’s eventual fruition, which is not likely to be before the later part of 2016. 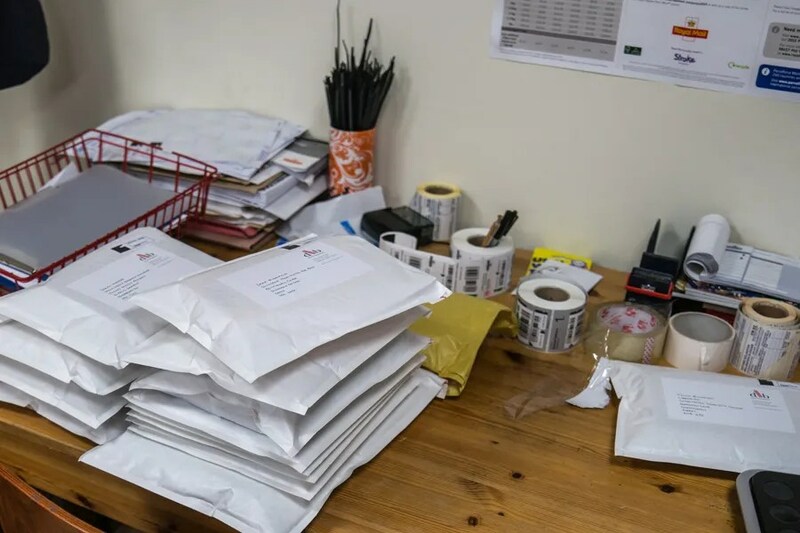 The boxed preview editions are being lovingly produced and assembled by hand with the express view of becoming collectors’ items and having a value of their own in the future, but their primary purpose is to interest foreign publishers to buy into and extend the print run. 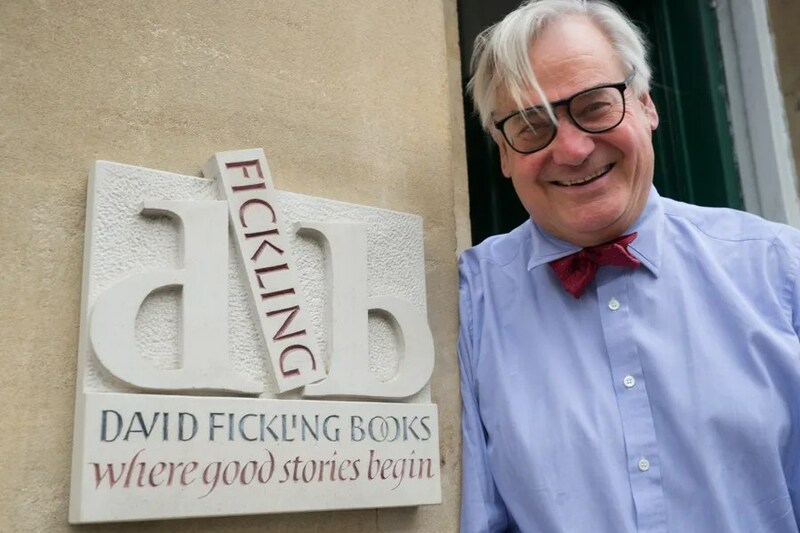 There had been a longstanding open invitation to me to visit the offices of David Fickling Books ever since it had been established as a Random House imprint based in Oxford over twelve years ago. It is now a fully independent publisher, working out of the same Beaumont Street offices, with its sister company The Phoenix just a couple of doors away. For a publisher of such influence and renown, with an annual lecture named after him, Fickling’s Wikipedia entry is woefully inadequate. But for all his larger-than-life, booming-voice, bow-tied presence, self-promotion and self-perpetuation do not really interest him, although he is very keen to leave behind a legacy and to create an enterprise that will have longevity. He likes to consider himself a merchant – someone who is producing fine artefacts, and bringing them to market. And he wants the David Fickling books logo to be a stamp of enduring quality. He is unabashed about the involvement of several family members in the publishing team. 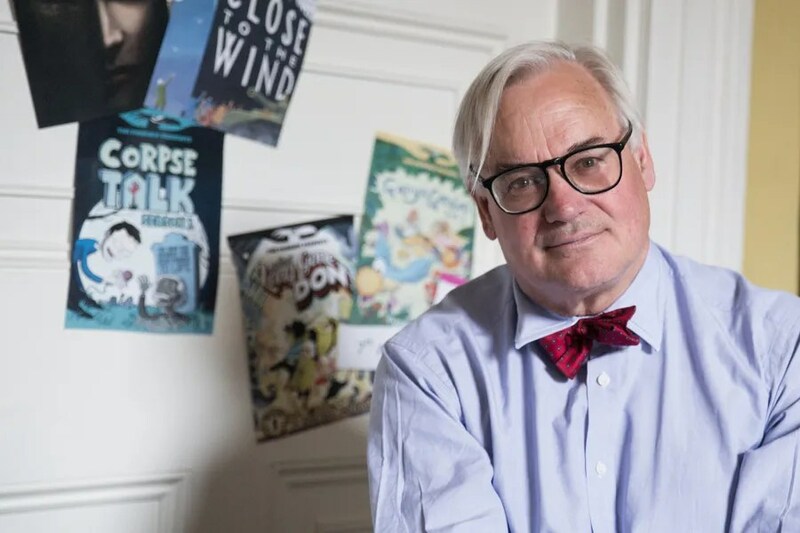 We joke about how he might be one of those publishers who retain an association with the firm well into old age, regularly turning up at the office into his nineties, keeping an eye on how the younger generations are steering things along. Now in his sixties, there is little sign of him taking things easy. The only indication I saw of his age was some tentative mobility on the steep flight of stairs down to the basement offices, from where, amongst other things, orders from the online shop are processed and dispatched. If an author is published by DFB, all that author’s works are available to buy from the DFB shop, even if published by a rival firm. Fickling still has on his office shelves many of the poetry anthologies from the 1980s that he worked on at OUP (including one illustrated by a fledgling Nick Sharratt, hired by Fickling) and says that poetry is something he is keen for DFB to feature prominently on its list. 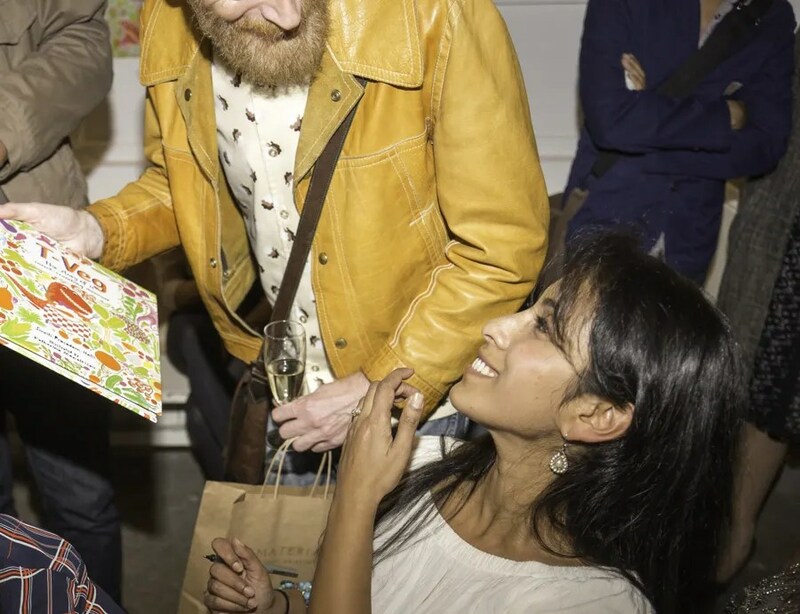 He is proud of having published a sumptuous edition of Wayland by Tony Mitton, illustrated by John Lawrence (and winner of last year’s CLiPPA Poetry Award). Taking a copy from the shelf, unperturbed by my confession that I had not enjoyed it as much as Mitton’s earlier, more lyrical work, he proceeds to read aloud several stanzas. 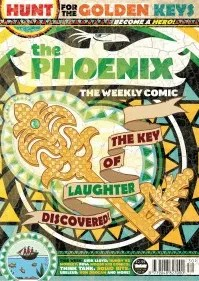 He sees this as one of the great tragedies of children’s reading over the last few decades, and is why he is so pleased that The Phoenix, successor to the DFC, a comic launched by Fickling seven years ago, is, now under the editorship of Fickling’s son, Tom, proving to be viable with a steadily growing subscriber list. The cover price of £2.99 seemed somewhat steep for a weekly comic when it launched in 2012, but now seems perfectly reasonable – The Beano is £2.20. I am taken two doors down the street to The Phoenix’s domain, and the atmosphere there is electric. Three of the most recent copies are thrust into my hand and I’m shown a mind-boggling grid mapping out features against weekly editions, as well as various illustrations and home-made copies sent in by readers. 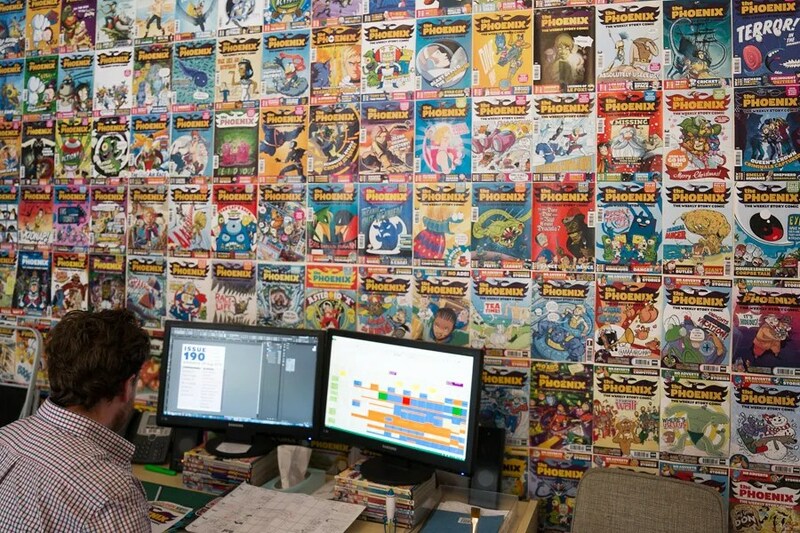 Amongst the editorial, illustrating and writing team in the back room is novelist John Dickinson (son of Peter Dickinson), author of the futuristic SF novel WE, whose official role with the comic is Chief Finance Officer, but also writes some of the strips. At the time of my visit there were Five Golden Keys to be found in order to SAVE the Phoenix from Doom. The finder of each key gets a feature page. Two of them had already been discovered, so two such features were included in the issues I took away. 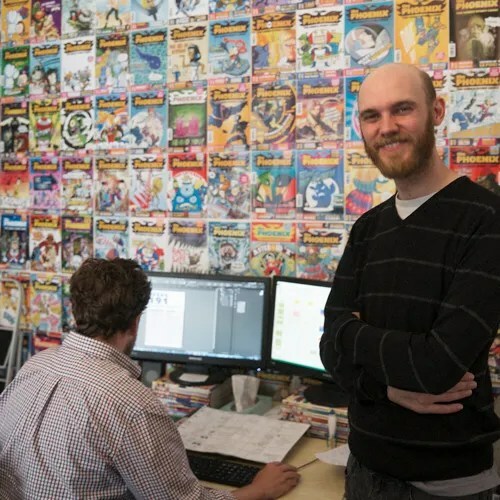 The comic has a a regular format with weekly features such as the Phoenix Phictionary, a FanFare page featuring contributed artwork, and Phoenix Soup – a double spread that includes a Q&A with one of the writers or illustrators, a book recommendation and more. There’s a great variety of comic strips which come and go through different sequences of editions (hence the need for the complicated planning grid). In issue 186 Dark Lloyd (a strip based on Jamie Thomson’s The Dark Lord novels) returned having been last seen in issue 170. I particularly liked Pow!, an almost wordless strip by Alexander Matthews that reappeared in issue 185 after an absence of nine weeks. As a regular reader one of the excitements about getting a new issue must be to see which strips are continuing, have returned or are taking a rest. As David led me out of The Phoenix offices and back along the street he stopped beside the specially commissioned stone engraving by Bernard Johnson which stands in place of a brass nameplate. When I got back to my car there was a note on the windscreen which read “Please don’t use my parking space again.” I cannot have followed Rosie Fickling’s directions to the unmarked secret parking space correctly, so my apologies to the disgruntled resident. 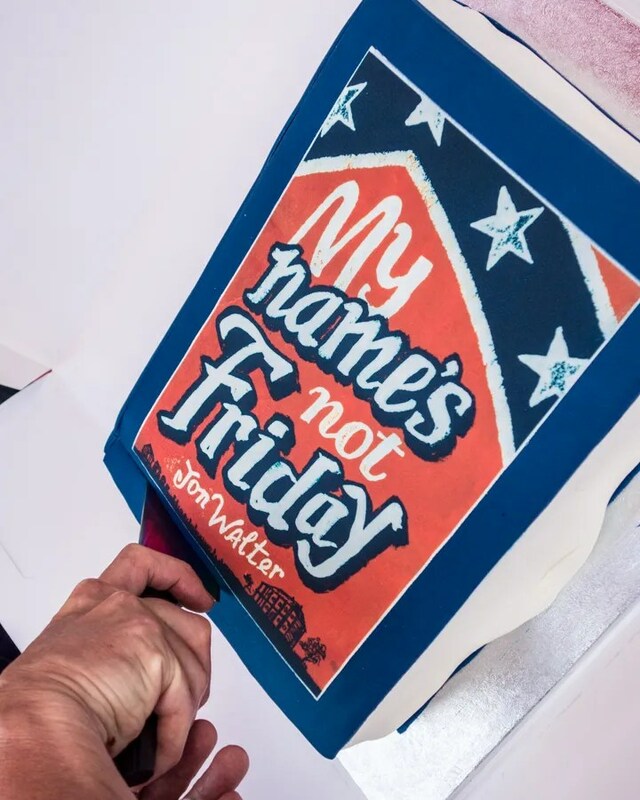 Here is publisher David Fickling, understandably excited about publication of Jon Walter’s second novel, My Name’s Not Friday, published last week and celebrated at a gorgeously warm and sunny launch party in Lewes, where the author lives. Here at ACHUKA we immediately recognised Walter as a special writer when his first book, Close To The Wind, was published last year. We were surprised that Close To The Wind was overlooked by various children’s book awards but feel certain this latest book will receive the attention it deserves. 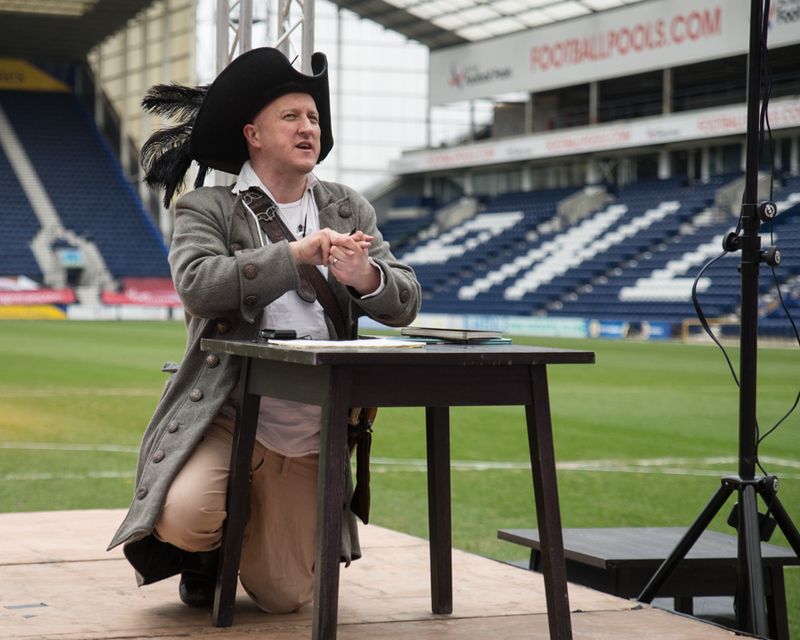 I know from personal experience how much work is involved and how nerve-wracking it can be to organise a single author visit attended by groups from half a dozen schools with a total audience of just a few hundred, so just imagine how daunting it must have been to envisage inviting not five hundred but five thousand children to attend a World Book Day event at a football stadium. 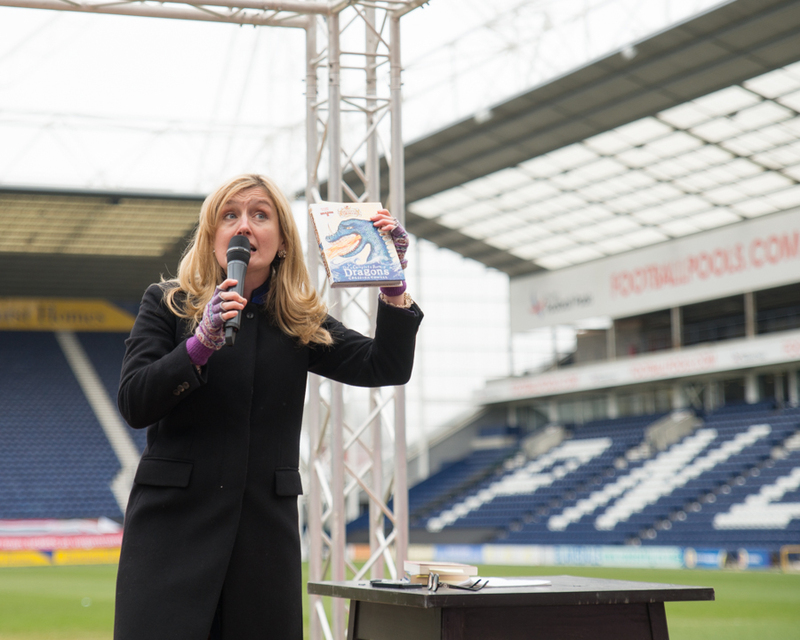 In recent years the concept of a single World Book Day has expanded to embrace a series of events held in different locations, collectively known as the Biggest Bookshow On Earth. 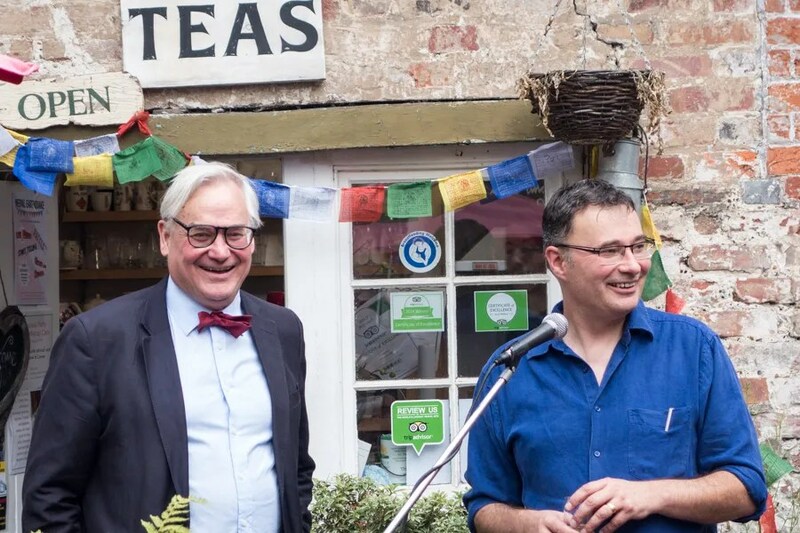 Last year, amongst the most successful of such Bookshows was one arranged by Jake Hope (previously of the Lancashire Library Service, now a freelance book consultant and events organiser) and Elaine Silverwood of Silverdell bookshop. 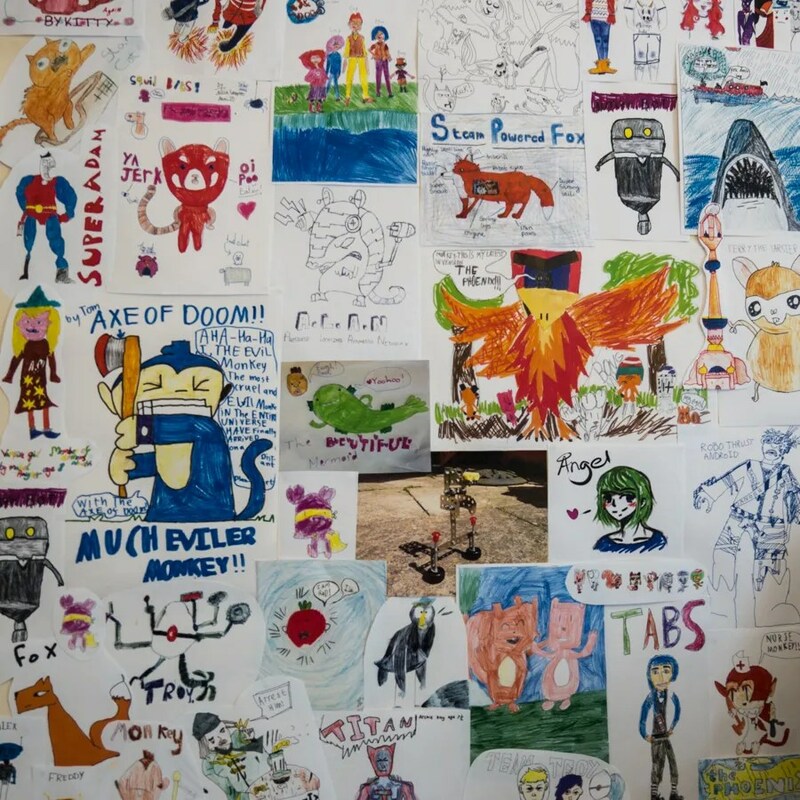 That event was held in King George’s Hall, Blackburn, with an audience of 1000 children. 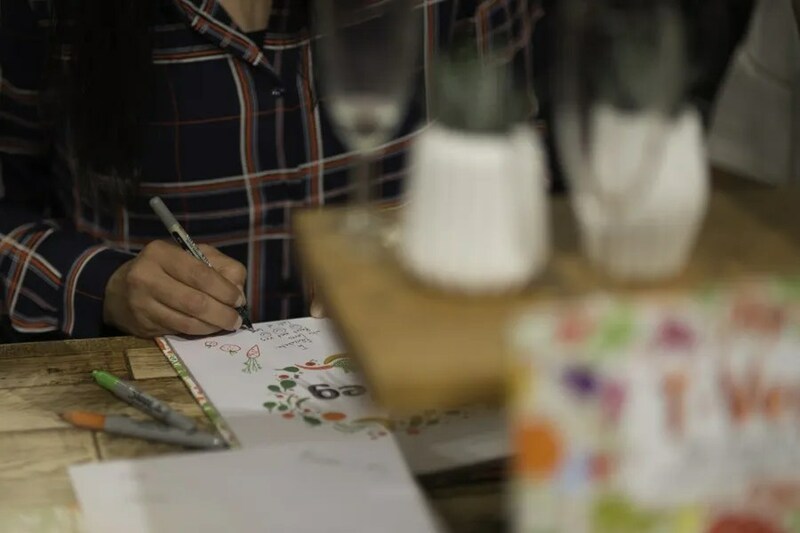 When Jake and Elaine were asked by Kirsten Grant of the World Book Day organisation to prepare to host a 2015 Bookshow on World Book Day itself, they were keen to try something a little bit big, a little bit audacious. 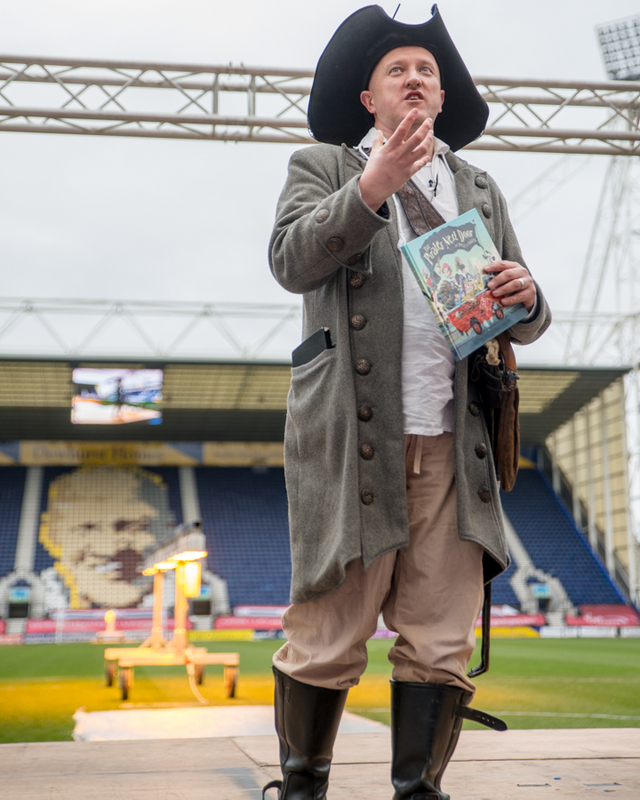 Jake, now in his mid-thirties, was very keen to design an event that would excite and enthuse boys and, although no football fan himself, he conceived the notion of hosting the Bookshow at Preston North End stadium. It helped his cause that the previous year’s venue was unavailable for a repeat booking. 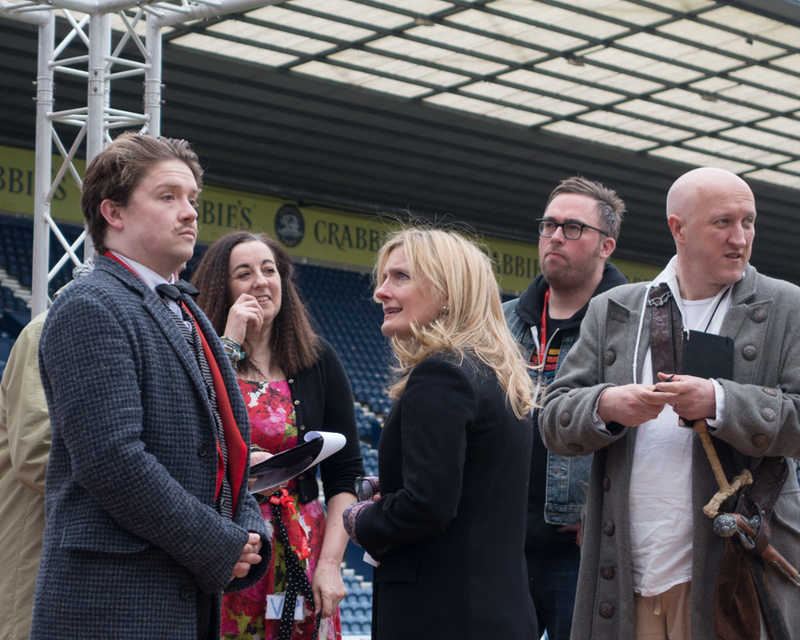 The format for the Bookshows – a panel of 6 authors, with one of the them serving as the MC – is the same for all, but each show is organised locally. 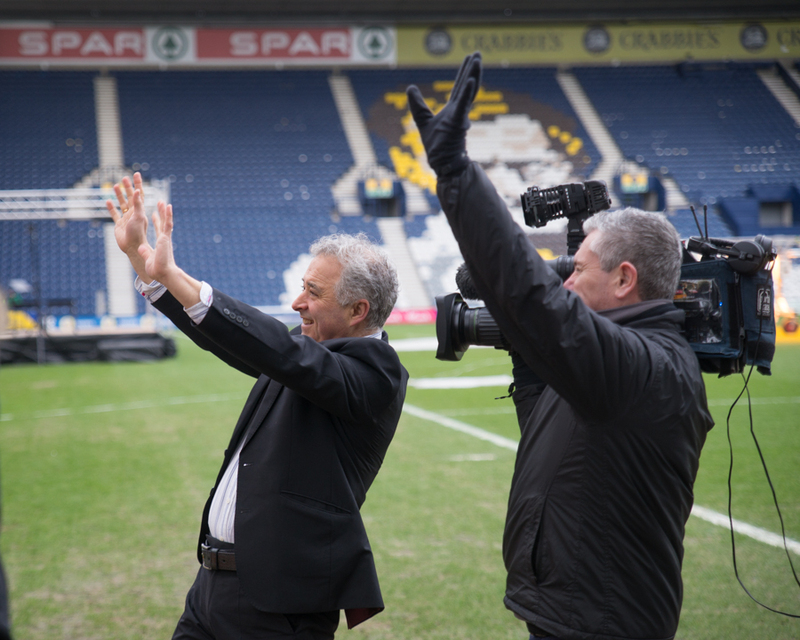 So it was totally down to Jake and Elaine to approach the stadium and negotiate arrangements. 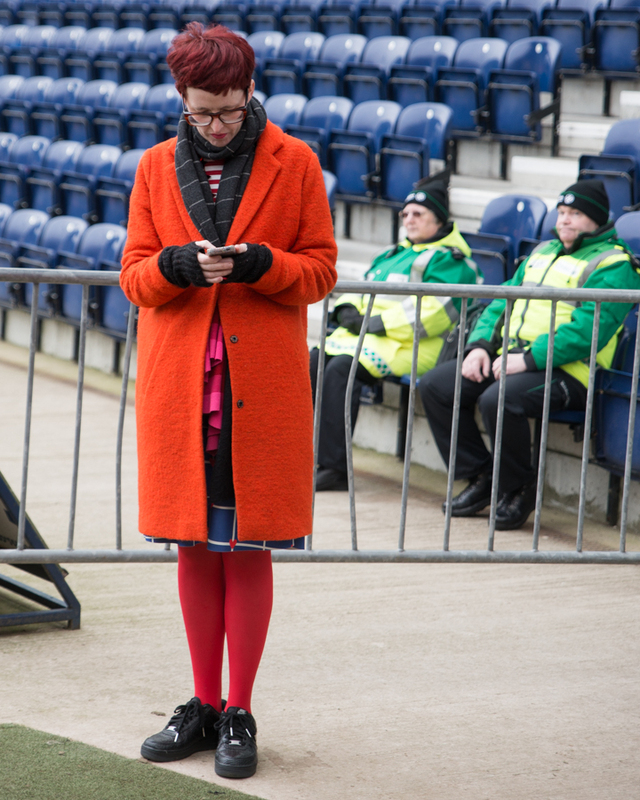 Mark Farnworth, the football club’s ground safety officer, was their main liaison. 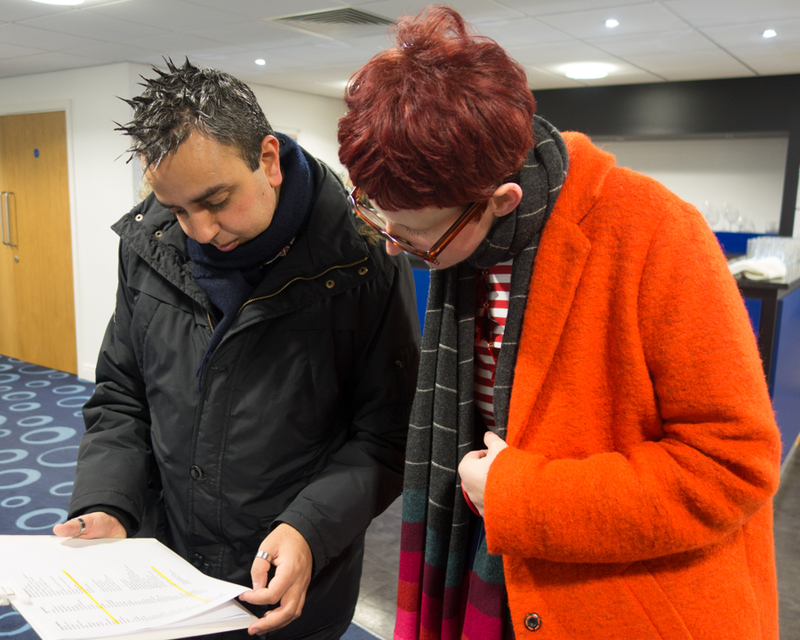 Because it was an event that involved school children, Preston City Council‘s health & safety team also had to be reassured that adequate first aiders would be on hand, so a large team from St John Ambulance had to be engaged for the day. 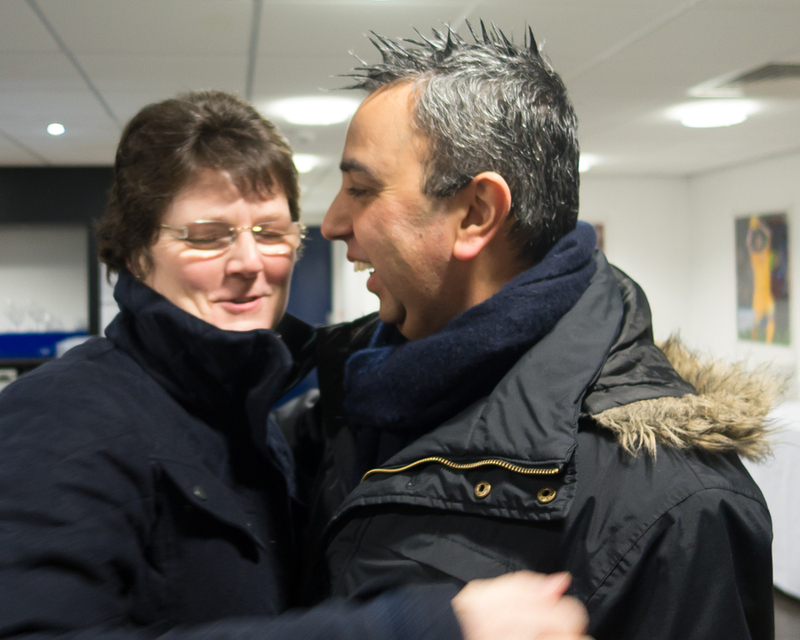 Jake has been a great friend to ACHUKA over many years, so when I received an invitation to attend the event, I was quick to book a return rail ticket to Preston (a city I’d not previously visited). 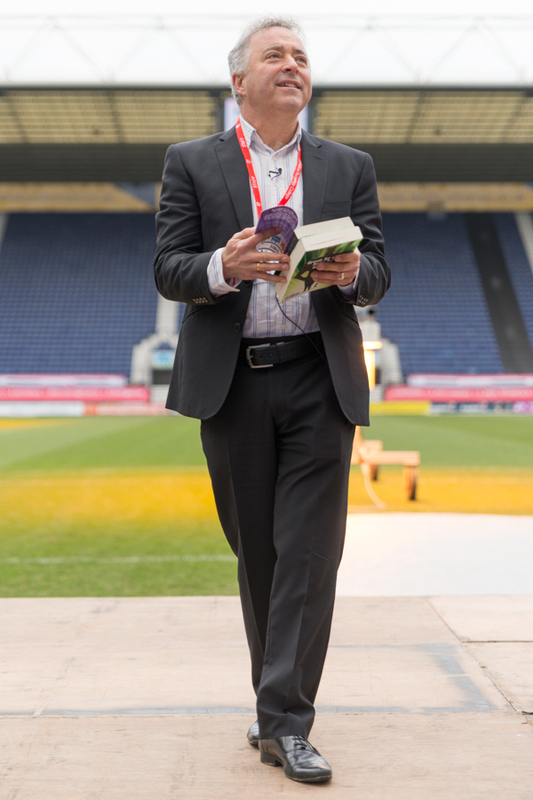 Let’s be in no doubt – this was a major undertaking, and both the chief organisers are to be heartily congratulated on carrying off such a spectacular large-scale event that did World Book Day proud. 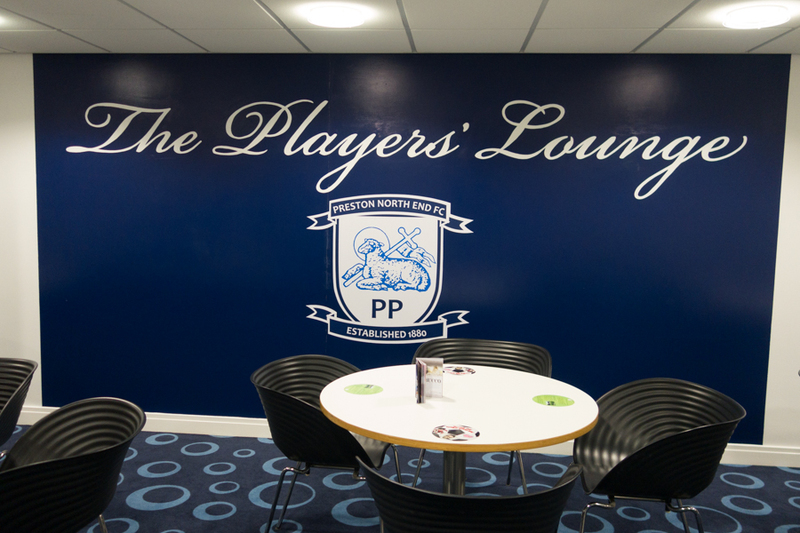 I was still hanging around long after the authors and other VIP guests had left, while Jake and Elaine – together with a small number of friends and helpers – put the Players Lounge (that had served as Green Room for the occasion) back to rights, and it was notable how repeatedly effusive the head groundsman was in his praise of the event. 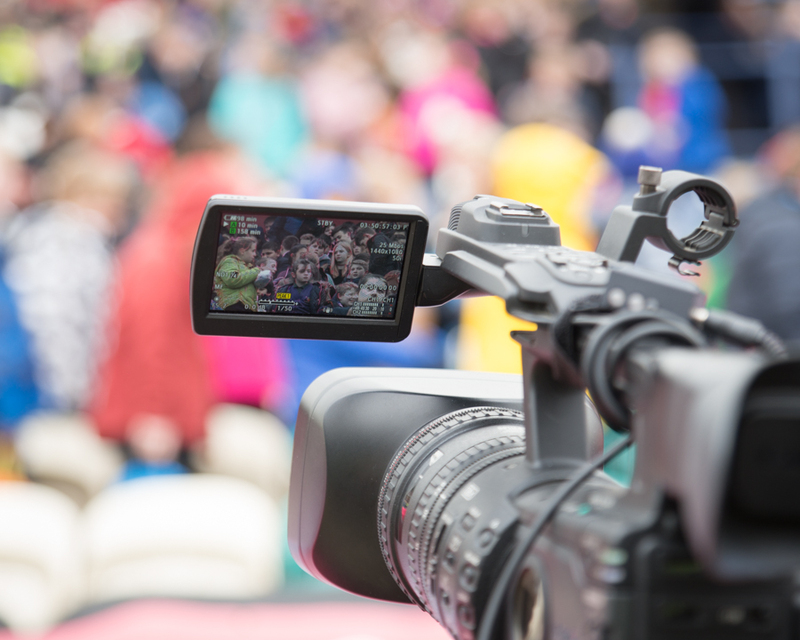 He went out of his way to say how much of an impact the children’s enthusiasm had made upon him – an enthusiasm that I am sure will have come across strongly in media coverage, which included CBBC Newsround, Granada TV and local radio. Any event throws up things to consider for the future. 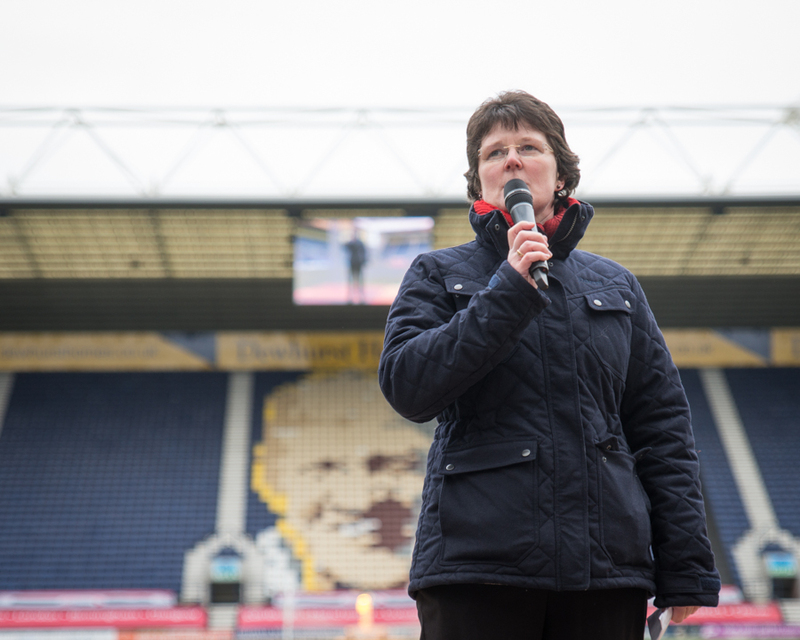 The technical side of the day was ably overseen by a student team from the local university, but because three sides of the stadium were empty, there was a mushy reverb to the sound which made hearing some of the presentations and announcements difficult. 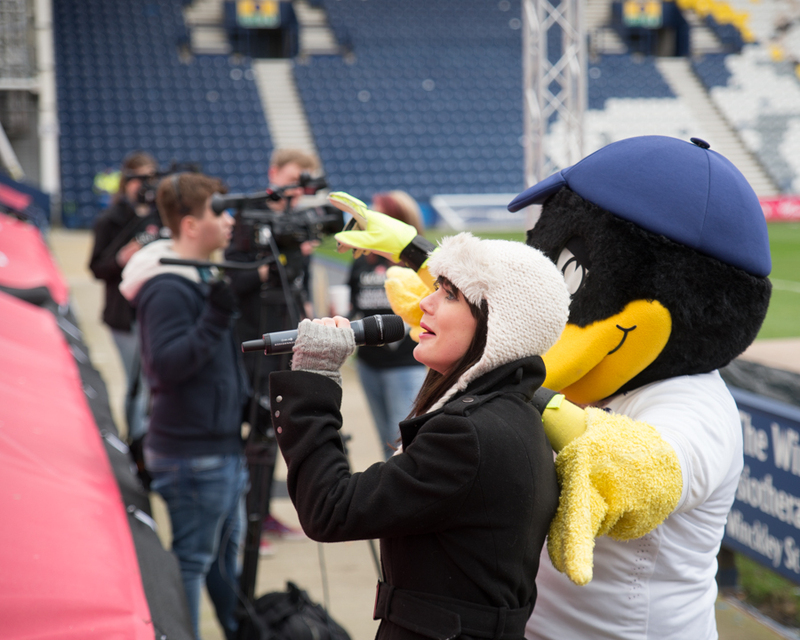 Sometimes the radio microphones played up, and it would have been better to revert to hand-held sooner than happened. Kirsten Grant confirmed to me that this was the first roadshow held outside of a theatre-style setting. 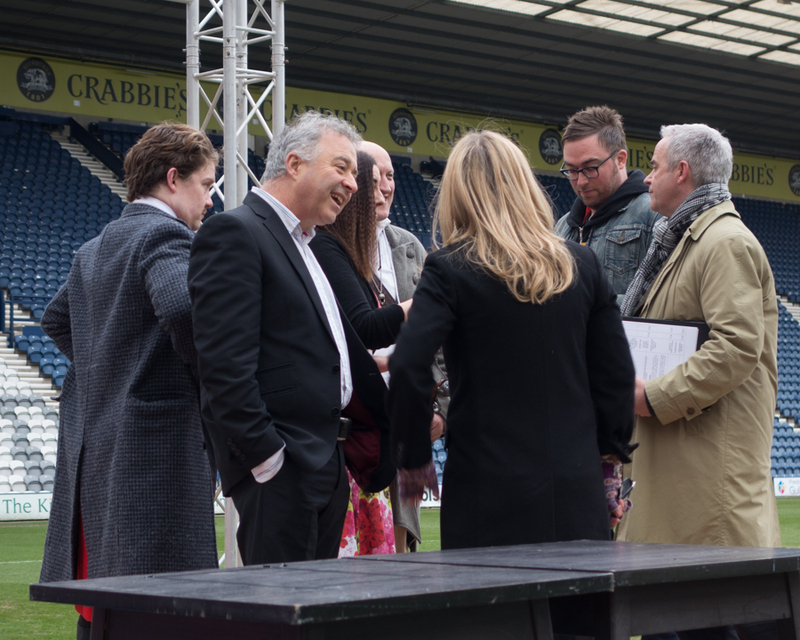 The format of author presentations was perhaps not best suited to the larger open-air venue and the acoustics of the stadium. The reading of extracts didn’t work as well as they do in more enclosed surroundings and there was a noticeable loss of audience engagement during these sections. The parts of presentations that worked best were those in which speakers connected directly with the audience: Cathy Cassidy communicating her passion for libraries, Cressida Cowell talking about her childhood holidays on a desolate Scottish Island, Frank Cottrell Boyce [whose slot was worst affected by radio mic issues] telling us about turning yellow as a boy, Danny Wallace in his amazingly confident and apparently debut author appearance. 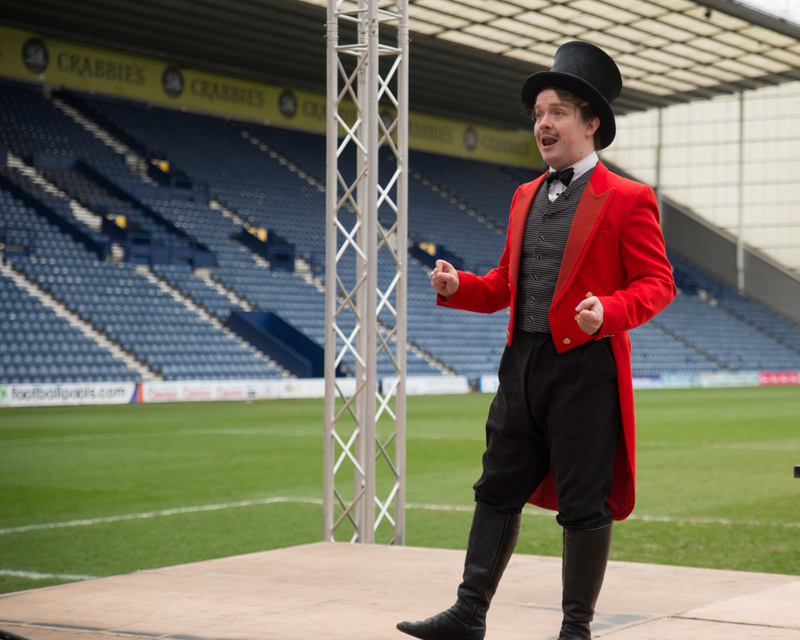 Stephen Butler, a trained actor and MC for the occasion knew how best to engage such a broadly spread audience, with exaggerated gestures and comments directed to different parts of the football stand. This isn’t a skill that necessarily comes naturally to authors. 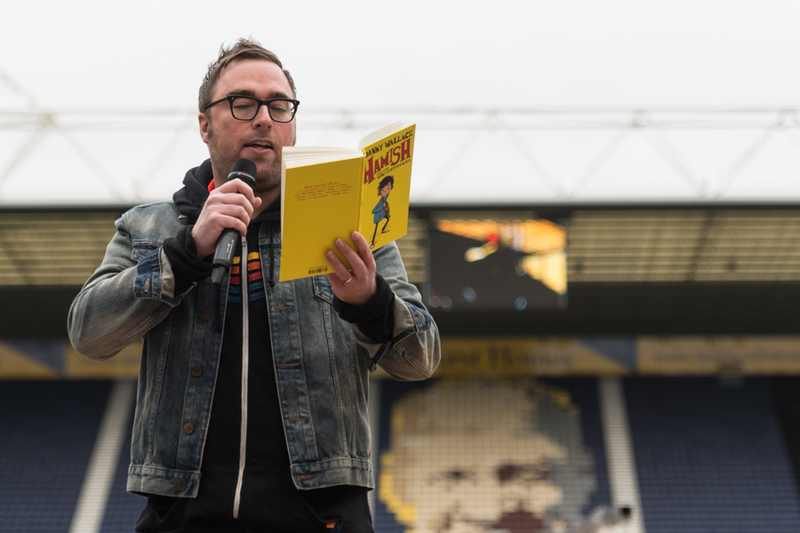 I’d love to think that this event will give World Book Day the confidence to organise similar large-scale gatherings in other stadiums, ideally with the inclusion of a poet or two. 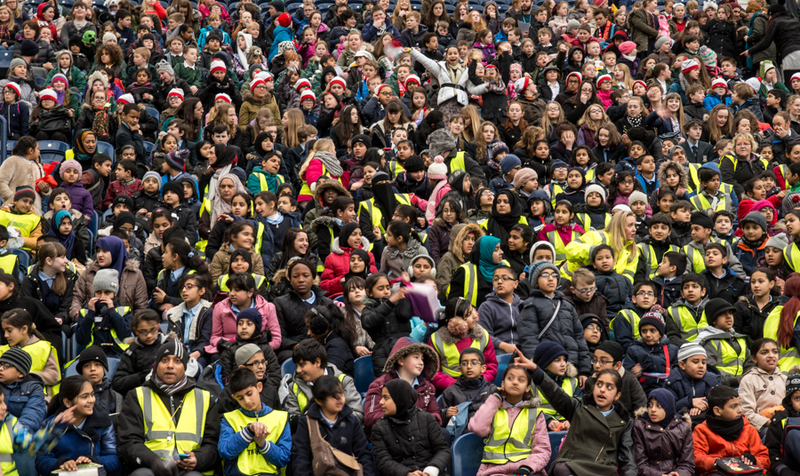 I couldn’t help thinking how John Agard or Jon Hegley might have animated the crowd – poetry is, after all, very popular with children in the 8-13 age group. 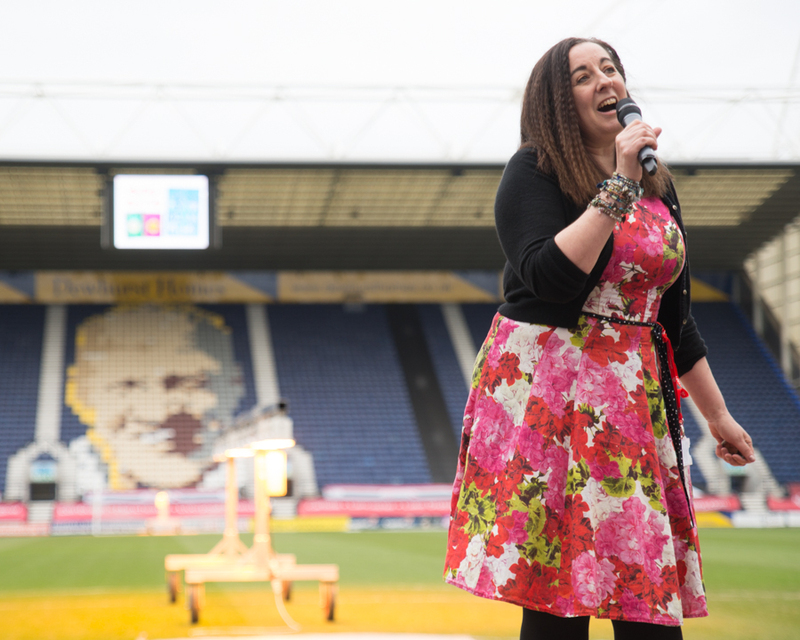 I think it’s a big ask to expect authors and illustrators to step up to ‘performing’ in a stadium without some prior experience of previous engagements with very large audiences. This is a personal view, and I realise it would complicate the current roadshow stencil, but a big open air event probably requires a different format compared with the theatre-style shows – with a lead ‘act’ (someone with performance pedigree – one of the fore-mentioned poets, or Eoin Colfer, David Walliams…) being given the bulk of the time, with shorter slots for supporting authors. But what a fantastic and memorable day this was. 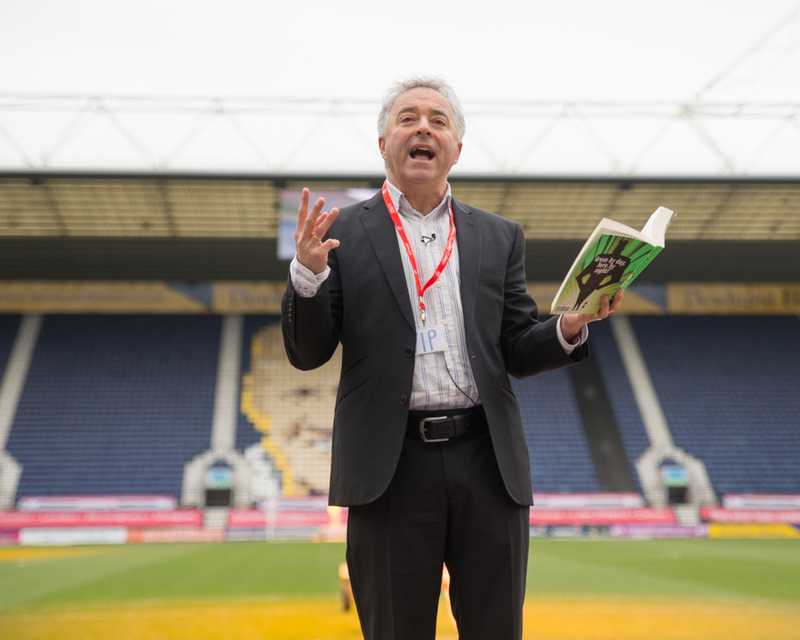 World Book Day 2015 will go down in history as the year of the big venue.